Review: Though Dario Argento’s 1977 film Suspiria has long been considered a giallo classic, filmmakers have been trying to remake it for decades. Most recently, it was going to be a project for Natalie Portman and director David Gordon Green, until arguments over the budget caused the in-demand duo to move on to other projects. Portman, who had begun training for the dancing in Suspiria, went on to win an Oscar for Black Swan, which was considered by many to be a film in the same vein. Though he had put a lot of heart and soul into his vision of Suspiria, even casting the film with some impressive names, Green wouldn’t delve into horror again until 2018 when he successfully rebooted Halloween. The person that brought the project to Green was director Luca Guadagnino who met with Argento and his co-screenwriter Daria Nicolodi to get their blessing to remake the film. With Green on to other projects and Guadagnino gathering strong accolades for his work, plans continued to simmer until it was officially announced in 2015. Three years later we have what Guadagnino considers an homage to the original film instead of an outright remake. Though the original Suspiria will always have a place in the horror history books for it’s gorgeous production design and creative visuals, Guadagnino’s version is the superior one with the director and screenwriter David Kajganich holding nothing back. It may lack the color and vibrant gothic-ness of Argento’s vision but it takes the morsel of an idea Argento set on the plate and turns it into a five course banquet of riches. Once again, the film is set in 1977 but the political unrest at the time is felt throughout and becomes a secondary character at times. Televisions broadcast news of a plane hijacking and there are demonstrations in the street from youths rebelling against their parents and grandparents who are being held responsible for the atrocities conducted in WWII. Into this mix comes American Susie Bannion (Dakota Johnson, Fifty Shades of Grey) who has arrived from the safety of her Mennonite upbringing. Growing up Susie always felt out of place in her devout and traditional family but an early exposure to the Markos Dance Academy creates a strange pull to the modern dance pieces they originated. It was her dream to attend and after an impressive audition she is granted a spot in the company. Susie has shown up right after the disappearance of Patricia (Chloe Grace Moretz, Dark Shadows) who we see at the beginning telling her therapist Jozef Klemperer that she thinks the academy is being run by witches. When Patricia vanishes completely, Klemperer begins to investigate on his own which will drum up painful memories of his past and endanger his future. At the same time, Susie is drawn deeper into the darkness that haunts the academy as well as the intoxicating aura of Madame Blanc (Tilda Swinton, Only Lovers Left Alive) who takes her under her wing. The bones of the film Argento created are still there, with Susie’s friends falling prey to an unseen evil but Guadagnino takes things further into more psychologically complex territory. With no male actors playing a major role in a film directed and written by men, the movie is completely void of a male point of view, a smart move made by Guadagnino and Kajganich to get out of the way of the imperious actresses hired to play their sinister characters. Suggesting the witchcraft at play is part of the undulating movements by the dance students and choreographed by Blanc, Guadagnino and Kajganich move away from our traditional thoughts of spells and sorcery. As Susie, Johnson gets her best role to date, showing just how much the Fifty Shades series failed to utilize her strengths. Far more nuanced than the original character portrayed by Jessica Harper (who pops up in an important supporting role here), Johnson’s Susie is innocent but not naïve, green but not inexperienced, clever but not all-knowing. Where she begins at the start of the movie and where she ends are light years apart and Johnson skillfully takes us step by step through her journey. As Susie’s friend that begins to get more suspicious of her beloved academy and teachers, Mia Goth conveys a nice amount of terror as she becomes a target of evil and Moretz’s brief appearance fits in nicely with the paranoia of her character. Guadagnino (Call Me By Your Name) has populated the staff of the academy with brilliant European actresses, all notable stars in their own right. It’s Swinton who is given center stage in not one, not two, but three different roles and the performances are, as expected, brilliant. That Swinton could so believably play multiple parts (and ages, and genders) is another tribute to her willingness to lose herself entirely in a role. The filmmakers at first tried to deny she was playing more than her central role of Madame Blanc but it quickly become a well-known fact that she was also playing Klemperer. The third role she’s playing I leave it to you to find out on your own. As a horror film, the movie delivers the shocks in several truly disturbing sequences that I’ve honestly had trouble shaking off. If you get woozy at the sight of blood this is definitely not the film for you as the last third of the movie is drenched in the red stuff. That being said, the violence is effective because it is so straight-forward and horrifying, some of it coming out of nowhere. A dynamite sequence interspersed with the troupe performing a new piece is a harrowing experience. There are also quiet moments, such as an outstanding epilogue that conjure the kind of emotions not usually felt in a horror movie. Special mention must go to Radiohead’s Thom Yorke for his first feature film score that is all moody creepiness and melds perfectly with several of Guadagnino’s uncompromising sequences. 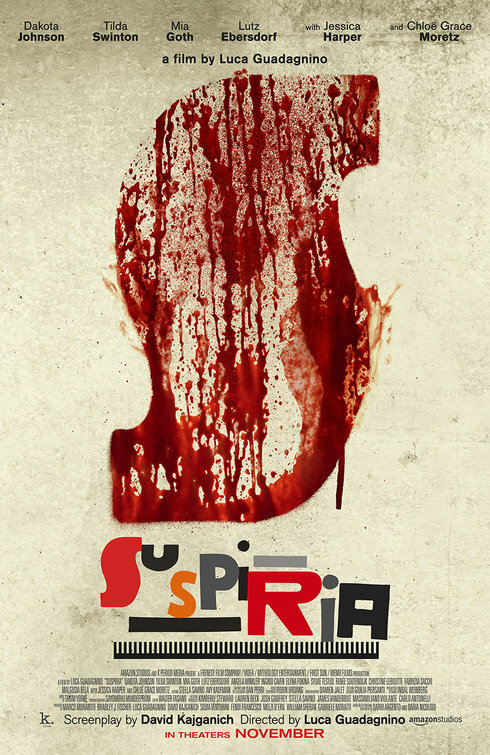 As is the case with many of these overtly arty horror films, Suspiria isn’t for everyone…nor should it be. At 152 minutes it’s a commitment but one that I felt flew by in a flash. Your experience will likely be different than mine, but I’m hoping people go into this one with their eyes wide open, knowing it’s a challenging film on many levels. I found it to be a largely unforgettable winner and a loving homage to the 1977 original. Synopsis: A darkness swirls at the center of a world-renowned dance company, one that will engulf the troupe’s artistic director, an ambitious young dancer, and a grieving psychotherapist. Some will succumb to the nightmare. Others will finally wake up. Thoughts: Whoa, this remake of Dario Argento’s 1977 horror classic looks far better and way more terrifying than I was expecting. Coming off of 2017’s lauded coming of age drama Call Me by Your Name, director Luca Guadagnino makes a major shift in tone for this creepy tale of a European dance company ruthlessly run by a coven of witches. From this brief look, the feel of the film seems in line with Argento’s stylish masterpiece but also doesn’t come off like a carbon copy. 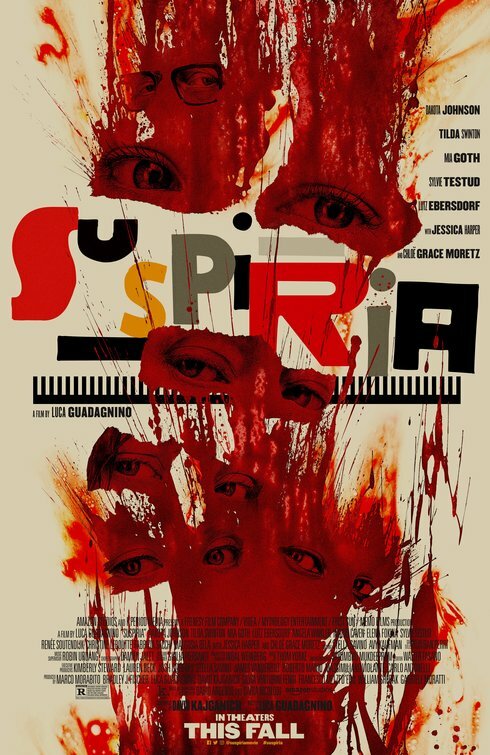 With stars Dakota Johnson (Fifty Shades Freed), Tilda Swinton (Only Lovers Left Alive), Chloë Grace Moretz (The 5th Wave), and original star Jessica Harper top lining and buzz steadily building based on early screenings of key intense scenes, Suspiria is one fall film to keep your eye out for…and then cover them in fear.